PHP Admin Panel (PHP AP) provides you access to the control features of your site as creating static or dynamical pages and allows your easily manage database tables with embedded PHP DataGrid. PHP AdminPanel Pro includes Creating, Reading, Updating and Deleting (CRUD) records in database tables on your existing site. You can edit menu options "on fly" and create new menu just in a few clicks. ...... database tables with embedded PHP DataGrid. PHP AdminPanel Pro includes Creating, Reading, Updating and Deleting (CRUD) records in database tables on your existing site. You can edit menu options "on fly" and create new menu just in a few clicks. 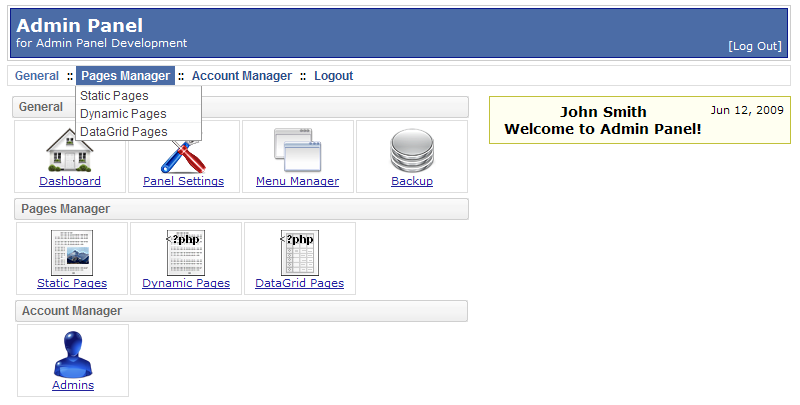 For a few minutes you get professional looking and fully functional Administration Panel for your new or existing site. PHP AdminPanel allows you to create DataGrid pages, even without programming knowledge! It dramatically reduce the development time of your web application. Qweas is providing links to PHP AdminPanel Website Back End Script 3.5.1 as a courtesy, and makes no representations regarding PHP AdminPanel Website Back End Script or any other applications or any information related thereto. Any questions, complaints or claims regarding this application PHP AdminPanel Website Back End Script 3.5.1 must be directed to the appropriate software vendor. You may click the publisher link of PHP AdminPanel Website Back End Script on the top of this page to get more details about the vendor.